Self-adhesive Sticky Notes are very useful for you and your colleagues, but also suitable as a promotional gift. Printed with your own logo, plus available in various sizes and colors. So jot down, stick, and voila you've got a memo that'll stick around for sure. Make your choice based on the number of colours that are containing your design. It is always possible to print your design in full colour (digital), but if you would like to have a higher quantity and your design in just 1, 2 or 3 solid colours (without gradient) than it is often cheaper to choose for PMS. 6 How many pads do you want? 50 100 250 Recommended 500 Not sure about the quantity? This is the most chosen amount for businesses. A sticky note is a small writing pad. Very useful to take notes at home or at the office. The sticky/adhesive edge is used to stick it onto most backgrounds so you won't forgot anything you write on it. The notes are available in multiple sizes and your own design. For the delivery of your sticky notes we use multiple carriers. Because of the highest reliability, in most cases we use UPS or DPD. The sticky notes that is chosen in most cases can be selected via our website. 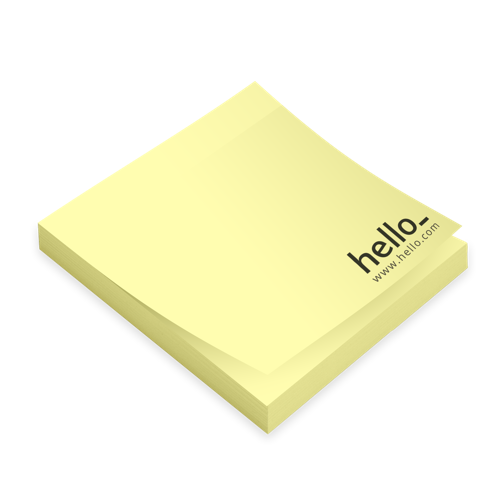 What type of material are Sticky Notes made? 80 gsm offset: This is the most often-used paper for copysets. The thin paper makes it easy to tear off. Because of it's structure the copysets are perfect for writing on. The adhesive strips can be placed on the leftside and on the top.